E-mail addresses have become essential parts of business cards, already outweighing street names, fixed phone line numbers, and fax numbers. The advantages enjoyed by messages are available 365 days a year, and they can re retrieved from any computer anywhere in the world. If you don’t travel very often, it’s easy enough for you to use local ISPs to receive and send e-mails, sort them into categories, and create your own directory. Individual providers differ in the size of the boxes they offer, with the goliaths being the e-mail services from the well-known chat room Xtalk.cz or the Slovak site, freemail.sk. As opposed to Hotmail, whose boxes are limited to 2 MB, addresses such as name@xko.cz and name@xmail.cz can be set to unlimited size with an unlimited number of attachments sent and received! You can’t access your e-mail by using POP3 protocol, but only by going to your browser’s web site. A lesser-known site called Katedrála offers, in addition to catalog searching and a full-text browser for the Czech and Slovak internet, free e-mail in domains such as name@e-posta.cz and name@eposta.cz, with 10 MB for messages and 20 MB for web presentations. Its simple appearance and intuitive operation are reminiscent of another young site – Centrum.cz. Besides most of the classic functions, Katedrála accomodates mobile phone users, who can handle their e-mails by using SMS messages. 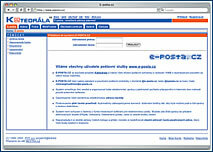 The site also allows mass downloading of e-mails – Multi POP – and supports POP3 protocol. It was precisely access to your box, at any time and anywhere, that Hotmail, the pioneer in the field, brought to perfection. In internet cafés in Mexico, China, and the Arab Emirates monitors blink in local linguistic versions, and all you need to do is type in your name and password, and you’re connected. 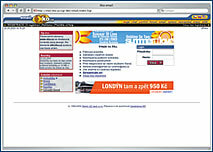 Those who refuse to support Microsoft, which runs the “hot mail” service, may make use of comparable e-mail services from mail.yahoo.com, or www.altavistamail.com, among others. On this site, the ordinary capacity of 10 MB for CZK 60 per year, can be doubled or even multiplied. The intuitive interface is nice – it has a minimum of advertising banners and windows, and offers users such services as synchronized transfer of directories with MS Outlook Express, e-mail notification to mobile phones via SMS, and protection against SPAM (unwanted e-mails). 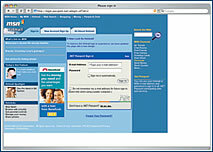 Setting up a free account with Seznam also gives users 10 MB of space at http://sweb.cz/name. Atlas has stayed ahead of the pack thanks to the reliability of its POP3 protocols, which allow e-mail clients to use Outlook and other sites where messages can be prepared off-line, along with SMTP for sending e-mails. Atlas also offers IMAP4 for reading only e-mail subject lines. People interested in setting up 15 MB boxes can choose from several domains, and the site offers many settings for demanding users, including advanced filters, automatic responses in your absence, and storing unfinished messages, and creating messages in HTML format. Want to refresh your English and relax at the same time? We recommend that you check out this address, for which you can register for no charge. For five correct answers, where you fill in words or individual forms of English verbs, you will be rewarded with a joke. Autumn is approaching, as is traditional kite-flying. If you want to experience the power of the wind, try the sport called kiteboarding – a combination of snowboarding, water skiing, and windsurfing, available via this site. This site, which is devoted entirely to notebooks, offers info about which products are soon to arrive on the market, and instructs owners how to configure your own PC according to name, manufacturer, and cost. At this cultural, educational, and political databank, users can search venue, date, time, and type of event in which they are interested. The site also offers autograph sessions, religious services, film festivals, meditation, carnivals, grape harvests, or hot-air balloon flights. – There are unwritten rules whose goal is to prevent chaos in discussion groups, the writing of e-mails, the use of ICQ, and making web presentations. Many users are aware of this, so there are endless proposals regarding “netiquette”, whose central idea is the same but whose approaches differ. Sally Hambridge of Intel claims that each new internet user should first be trained and learn about the possibilities and technical limits of its use. Such knowledge, combined with honesty and good morals, would contribute to users not sending unnecessarily large documents, automatically deleting unnecessary information, refraining from writing SPAM, or soliciting/bothering unknown addressees.